This workshop will provide insights into the life of people living in New England in the eighteenth century and tips on how to recover evidence of their lives and personalities through letters, diaries, vital, church and town records, tax valuations, wills, deeds, and other materials. 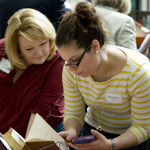 The American Antiquarian Society Reading Room Manager Kimberly Pelkey will provide an overview of the resources available at the Society, including our digital resources. This program will take place in the Goddard-Daniels House, 190 Salisbury Street, Worcester, MA. Additional information on other hands-on history workshops. For further information, contact Kayla Haveles at khaveles@mwa.org or call 508-471-2129.